I’ve recently been involved with a SMED (single minute exchange of dies) kaizen event. The event itself was extremely effective and tons of fun… and while I could share the specifics of the event with you I won’t. Instead, I want to focus on one particular part of the kaizen that I feel greatly attributed to our success – the video taping process. Specifically I want to share some tips that may help you out if you decide to use video in the future. First of all, before you even think about rolling video on someone… be sure to get their permission and their manager’s permission. In some cases it’s probably not a bad idea to let human resources know as well. If you work in a union environment or in certain parts of the world video taping may or may not be allowed. Next, once you have permission you need to spend some quality time with the “talent” meaning the person you plan to tape. During this time you must explain why you are taping them, how the footage will be used, and how you are not out to catch them making a mistake. In many cases an operator will feel a tremendous amount of anxiety when being video taped so please take the time to put their mind at ease. Now, there are a few ways to go about recording the video. You can set the camera up in such a way as to see the entire process. This method probably helps relieve the stress of the operator a little. The downside to this approach is you are often limiting yourself as to what you can see. For example, it may be nice to zoom in once in awhile. Also, if you are watching a process like a CNC lathe it may be difficult to capture everything from far away (I learned this the hard way). With this said, I am personally a fan of getting as close as possible while not being in the way to record footage. Another tip that has worked well for me is to ask one of the operator’s colleagues, preferably someone they really like, to operate the camera. This helps relieve anxiety and can even make the process fun for all involved. Further, the “friend” may be quite familiar with the process being recorded in which case they can offer a small narration as to what is happening. This makes the analysis of the video tape much easier. Finally, it is absolutely critical to include the operator in the analysis of the video tape. The main reason is they are the best person to help you identify the various “elements” of the process. Also, they’ll likely have the best ideas for improving the process once you have taught them the basic principles of SMED. 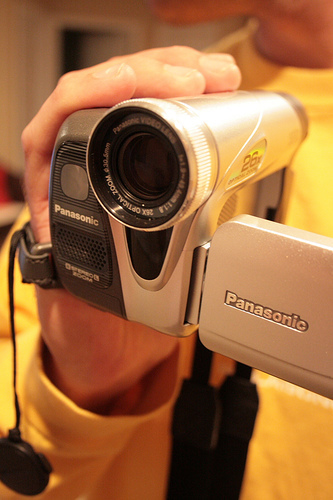 These are just a few tips I’ve learned… what video taping tips do you have? To keep track of what we’re up to here on LSS Academy please consider subscribing to our full feed RSS. You can also subscribe by email and have new articles sent directly to your inbox. Finally, you can follow us on Twitter along with a number of other lean and six sigma bloggers. All good points. One that I hadn’t thought about was letting another operator run the camera. That’s worth considering. I am planning on using the camera initially to film certain manual steps for later MTM2 analysis to get correct time value for them. And also longer sequences to use as reference material when I prepare initial work instructions for new plant. My great plan is to use only pictures in them, no or at least very few written words so that people of any language can understand them. My biggest tip is plan on filming the process at LEAST twice. The first time you’ll only end up finding out all the things you wish you would have recorded. SMED events are very fun. Great piece. I really like the colleague taping. We do not use video much (yet) but this inspires a new idea for me in regards to stop-watch timing and other gemba activities. I will share one tip – we did a SMED project which involved several maintenance people working on the machine simultaneously. We had 4 video cameras, clocks all synchonized. The plant manager actually invested in 4 small TVs, and we watched all 4 tapes simultaneously. Powerful! The mechanics figured out very quickly that they could pair up on some tasks or help one another prep during idle time. Results? 70% reduction in set up time for the line. Five simple, and yet when combined together, powerful suggestions. We video some executive interviews and I’ve learned to do a sound and light check before we actually start the interview. Just run the camera for 10-15 seconds and then playback. You’d be surprised how many times just a minor adjustment will make a big difference in the finished product. If the person being taped is nervous, make a show of “testing” the camera and tape yourself. Take 10-20 seconds and walk through the motions of a changeover. If you can somehow screw it up a bit, like a blooper reel, it can help relax people. Letting them visualize first how it will look in film can also help them feel more comfortable.